We can’t believe our sweet boy is five today!!! He has marked us, changed us, and blessed us sooo much!! Caleb Scott, thank you for making me a mommy!! You are one incredible kid, and I am so proud of you!! We love you so much! Adorable!! Happy Birthday Caleb! He is so big and so cute! Great job Erica! So cute! 🙂 HAppy birthday Caleb! Yaaaay! 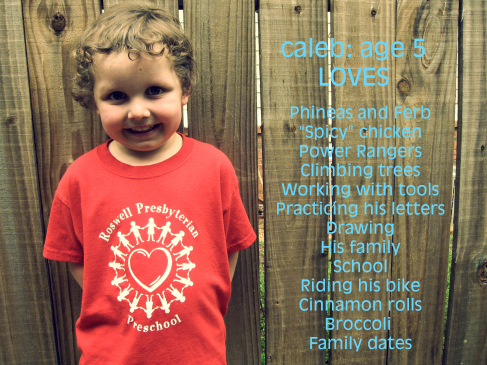 Happy birthday sweet Caleb.